As the smoke clears from the fevered discussion on The Cloud, the term “hybrid IT” has emerged as a new rallying cry for IT departments worldwide. It may, in fact, be considered a tempered view of cloud computing–one that takes a more realistic stock of some of the challenges associated with moving all of an organization’s computing resources to the cloud. As you may recall from an earlier post, the cloud isn’t actually a place but rather a strategy where you run your applications on someone else’s computers in someone else’s datacenter (usually AWS, Google or Microsoft). In theory at least, this saves lots of money, gives you more flexibility, and allows you to focus your business on your core competencies, rather than running a datacenter. In practice, companies have found that moving to the cloud can be difficult, and impractical in many cases (and it doesn’t always save money, but that’s a different story). Despite all of this, the arguments for going to the cloud are sound, and there’s general agreement that the cloud is where IT infrastructure is going to go, eventually if not in the near future. So in the meantime businesses find themselves in something of an in-between zone, where they run some of their resources on-premise, but also run a significant portion of their resources in the cloud–otherwise known as a “hybrid” approach to IT. Think about it like hybrid cars, for instance, where you’re hoping to get the strengths of two different engine concepts models–combustion, and electric power. The assumption is that neither is ideal yet, but that if you combine them, you get something that’s better than either of them could provide alone. 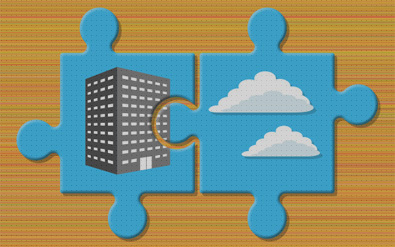 The same goes for hybrid IT, where you’re hoping to both minimize the weaknesses and maximize the strengths of two very different models, the cloud and on-premise. In addition to running resources in the cloud and on-premise, hybrid IT may also involve using what’s referred to as a “private cloud”. Conceptually this is a little bit murky, because it sits somewhere in between the cloud and an on-premise datacenter, and there’s some disagreement as to what the term actually means. In many cases, a private cloud involves renting resources from a vendor, such as HPE, VMWare, Oracle, IBM or Dell EMC, and running IT operations on their infrastructure. The main difference between this kind of private cloud and the “public cloud” (which is usually just referred to as “the cloud”), is that the hardware is reserved entirely for that one company, whereas in the public cloud, you might have resources from one company running on the same hardware with other companies (often referred to as a “multi-tenant” approach). Companies may go this route for security reasons, or because it makes it easier to comply with government regulations. There are also private cloud models that are run entirely by the companies themselves, although it’s arguable that this isn’t really cloud computing, because you’re saddled with all the same responsibility and baggage that going to the cloud is supposed to help you shed. For IT, the hybrid model allows something of a safety net. They can move applications and infrastructure to the cloud at their own pace, without upending business processes or exposing the company to too much risk at any one time (such as the risk that moving a critical application will cause it be unavailable longer than anticipated, or that when it gets moved to the cloud it doesn’t work as well, or that your data is exposed to a breach). It allows IT departments to play around with the concept without diving in head-first, thus they can start to gain some of the benefits of cloud computing even if they’re not ready to fully commit. In reality, just about every major company has a mix of resources running in the cloud and on-premise, begging the question, if this is what pretty much all IT looks like nowadays, why not refer to hybrid IT as just plain “IT”? When put into practice correctly, hybrid IT isn’t just that resources are run in “mixed” environments, but that everything–whether in the cloud or on-premise (in company-owned data centers)–is run as a single, centralized system. This is similar to the concept of virtualization, and hybrid IT does in fact rely on no small degree of virtualization to work. Ideally, for the folks who depend on the various applications, the complex hybrid infrastructure–though it may in reality reside even in different continents–appears like a single, seamless infrastructure. What’s more, in the perfect hybrid world, you’d be able to use the public cloud to expand or supplement computing power for applications that are running on-premise, a strategy that could be very useful for companies that aren’t entirely sure how much computing power they’ll need. If that sounds tricky, it’s because it is. It introduces a lot of complexity around issues like connectivity, governance, billing, vendor management, and generally requires new skill sets and culture shifts, as the principles of cloud and on-premise computing are quite different. Not surprisingly, there’s a vast array of consultancies that are dedicated to helping companies run effective hybrid IT environments. With that said, hybrid IT is going to be the preferred model for some time for the simple reason that going 100 percent cloud-based isn’t feasible for most organizations, no matter how much they may want to, so we can expect those consultancies to stay busy!